Escalators whir. Easy listening drones. The air is conditioned. Two middle-aged women walk by in sweats, rain jackets tied around their waists, passing stores that haven’t opened for the morning—if they’re opening at all. 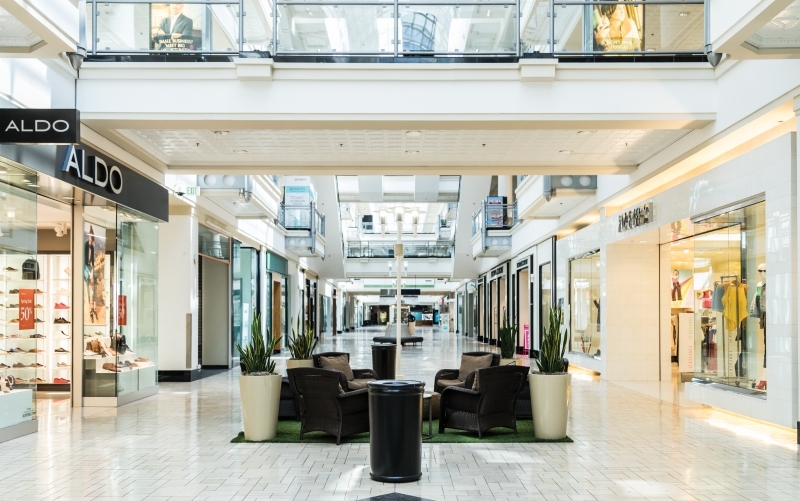 It’s 9 a.m. in the eerie cavern of the Westside Pavilion mall, launched to acclaim in 1985 and slated to become roughly 80 percent office space by 2021. Anchoring tenant Macy’s closes in four days. The other longtime tentpole, Nordstrom, shuttered last September. A heavy rain falls. The first spaces of this kind were built in the Midwest in the 1950s. In the next half century, the United States became home to as many as 1,500 malls—a beige army of food courts and Orange Julius stands and a mix of department stores and smaller outlets that blandly defined what it looked like when we came together to eat and shop. The Westside Pavilion is where Tom Petty sang “Free Fallin’” in his 1989 video, where Tim Allen got his fake tan in Christmas with the Kranks. It even expanded in the early ’90s. But as the sun struggles to penetrate the atrium, the floors are ghostly quiet in Macy’s, where you could snag a Nautica dress shirt for nearly nothing and also buy the rack it’s hanging on—plus an empty jewelry case and a mannequin in the shape of a little girl. Whatever damage internet shopping did to spaces like this became nearly fatal during the Great Recession of the late 2000s, when the country chilled to the idea of frivolous browsing, let alone buying things we probably didn’t need. But malls were already struggling to find their place in a changing world. Hollywood & Highland opened in 2001 when mixed-use outdoor shopping became the thing. Paseo Colorado went the same route, opening that year to tepid response; it’s being re-envisioned once again, with a hotel and condos replacing the Macy’s. So what are malls for, and how can they thrive? “Shoppers are in control of the shopping journey now,” says Ray Hartjen, director of marketing at RetailNext, a shopping data and analytics firm. You see it at Westfield Century City, which reopened in October after a $1 billion reboot that came with private elevators for VIPs, a perpetually crowded Eataly, and lounging areas that feature hanging beds and comfy cushions. And, of course, you see it at Rick Caruso’s Grove, with its trolley and pioneering blend of Disneyesque faux realism and retail. Caruso doubles down with Palisades Village, set to open later this year with a shop-lined Main Street complex and central lawn, complete with the picnic blankets Caruso also offers at Glendale’s Americana at Brand. You might be tempted to think places like these aren’t really about commerce at all, but instead a certain kind of photogenic hanging out—with food and retail opportunities in case you’re so inclined. This is, Hartjen says, a result of the fact that none of us actually have to go to the store or mall anymore. At the Pavilion—a project by quintessential mall architect Jon Jerde, who also designed Universal CityWalk and Las Vegas’s Fremont Street Experience—you won’t find much to Instagram. Teenagers come and go in surly waves, and the LAPD rousts a man who has fallen asleep. “You can always come back tomorrow,” an officer says, and another tinny song bounces of the walls. Maybe it was more honest when a mall didn’t try to be something other than what it was; maybe the day will soon come when we’re nostalgic for something simpler. For a while, there was even talk of tearing the roof of the Westside Pavilion, but Westside real estate is too valuable and office space too scarce. There’ll still be some retail here, according to owner Hudson Pacific Properties. And the luxe Landmark Theatres—quiet at this early hour—will remain as well. For now, tables open up at the food court, then fill again. An H&M employee folds and refolds a sweater. Sometimes you don’t want to work, and you also don’t want to be at home. For a little while longer, you could circle the first floor of an L.A. institution and maybe not see another customer. As for the shirt you were hoping to take home, various web retailers offer same-day delivery.